Since most kids have returned to school and temperatures are getting cooler in much of the country, many of us are starting to crave fall's comfort foods. When thinking of familiar comfort foods, we often think of meals loaded with extra calories, carbs, and fat -- but that doesn't have to be the case. In fact, warm, filling soups are an excellent way to satisfying cravings, especially when you use healthy shirataki noodles in place of wheat pasta or white rice. For this month’s featured recipe we're introducing our new Skinny Minestrone Soup made with Skinny Noodles Macaroni and fresh zucchini (in peak season now). 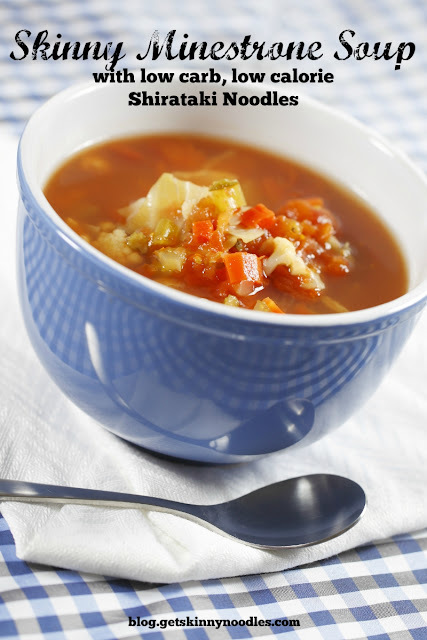 This healthy version of the classic Italian soup has under 100 calories per serving and only 17 grams of carbs -- which is less than half of the calories and carbs for minestrone soup made with regular macaroni noodles. 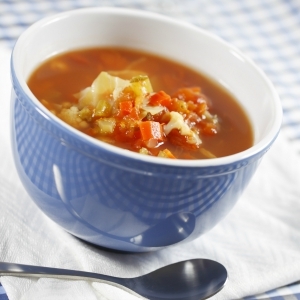 In addition, this soup can be made either in the slow cooker or on the stove top. To make on the stove, simmer all the ingredients on low for about 40 minutes. If you're new to shirataki noodles, soups are an excellent way to get started. Just drain the shirataki noodles, rinse well, and add to soup. As we've mentioned in previous posts, shirataki noodles also are perfect in slow cookers because they cannot get overcooked and mushy like regular pasta. (For most slow cooker recipes, you can add drained and rinsed shirataki noodles in the last 20-30 minutes of cook time.) And if you live where temperatures are still warm, making soup in the slow cooker saves you from turning on the stove for a long period and needlessly heating up the house. Saute carrots, celery, onion, and garlic in oil over medium-high heat about 15 minutes, or until tender. Transfer to slow cooker along with broth, tomatoes, beans, salt, and pepper. Add rosemary, bay leaves, and basil; cover and cook on low for 6-8 hours or on high 4-6 hours. About 40 minutes before the soup is done, add zucchini, spinach, and Skinny Noodles Macaroni. Cover and cook 30 more minutes. Remove bay leaves and rosemary sprig. Serve hot topped with Parmesan cheese if desired. Makes 8 servings.